Global fossil fuel emissions are on track to rise for a second year in a row, primarily due to growing energy use, according to new estimates from the Global Carbon Project, an initiative led by Stanford University scientist Rob Jackson. The new projections come in a week when international negotiators are gathering in the coal-mining city of Katowice, Poland, to work out the rules for implementing the Paris climate agreement. Under the 2015 accord, hundreds of nations pledged to cut carbon emissions and keep global warming "well below" 2 degrees Celsius above pre-industrial temperatures. "We thought, perhaps hoped, emissions had peaked a few years ago," said Jackson, a professor of Earth system science in Stanford's School of Earth, Energy & Environmental Sciences (Stanford Earth). "After two years of renewed growth, that was wishful thinking." The Global Carbon Project's report, titled "Global Energy Growth Is Outpacing Decarbonization," appears Dec. 5 in the peer-reviewed Environmental Research Letters, with more detailed data published simultaneously in Earth System Science Data. The group estimates global carbon dioxide emissions from fossil fuel sources—which represent roughly 90 percent of all emissions from human activities—will reach a record high of just over 37 billion tons in 2018, an increase of 2.7 percent over emissions output in 2017. That compares to 1.6 percent growth a year earlier. Emissions from non-fossil sources, such as deforestation, are projected to add nearly 4.5 billion tons of carbon emissions to the 2018 total. "Global energy demand is outpacing powerful growth in renewables and energy efficiency," said Jackson, who is also a senior fellow at Stanford's Woods Institute for the Environment and Precourt Institute for Energy. "The clock is ticking in our struggle to keep warming below 2 degrees." In the United States, emissions of carbon dioxide are projected to increase 2.5 percent in 2018 after a decade of declines. Culprits for the increase include unusual weather—a cold winter in Eastern states and a warm summer across much of the nation ramped up energy needs for seasonal heating and cooling—as well as a growing appetite for oil in the face of low gas prices. "We're driving more miles in bigger cars, changes that are outpacing improvements in vehicle fuel efficiency," Jackson explained. Overall, U.S. oil use is on track to rise by more than 1 percent this year compared to 2017. Consumption of one fossil fuel, however, is no longer on the rise: coal. The study shows coal consumption in Canada and the United States has dropped by 40 percent since 2005, and in 2018 alone the U.S. is expected to take a record-setting 15 gigawatts of coal-fired capacity offline. "Market forces and the drive for cleaner air are pushing countries toward natural gas, wind and solar power," Jackson said. "This change will not only reduce CO2 emissions but will also save lives lost to air pollution." Yet the study shows renewables around the world are largely coming online as add-ons to fossil fuel energy sources—particularly natural gas—rather than replacements. "It isn't enough for renewables to grow," Jackson said. "They need to displace fossil fuels. So far, that's happening for coal but not for oil or natural gas." Over time, the researchers warn increased coal use in regions where large swaths of the population lack access to reliable electricity could eventually exceed the steep cuts to coal use elsewhere. India's emissions, for example, are projected to grow by 6 percent this year as the country races to build new power plants for both industrial and consumer needs. "They're building everything—wind, solar, nuclear and coal—very quickly," Jackson said. Energy demand is rising around the world. "It's the first time in a decade that the economies of essentially all countries are growing," said Jackson. According to the study, the biggest change in carbon emissions this year compared to 2017 is a substantial uptick in both energy consumption and emissions in China. After four years of stable emissions amid pressure to improve air quality, the country has now hit the accelerator. Global economic growth has increased demand for iron, steel, aluminum and cement manufactured in China. Meanwhile, a recent slowdown in China's own economy prompted the country to shift its approach to energy development. "China is jump-starting coal projects that were on hold," Jackson said. As a result, the country's emissions are expected to rise by 5 percent in 2018, up from an increase of roughly 3.5 percent the previous year. This year's estimates in some ways mark a return to an old pattern, in which economies and emissions rise more or less in sync. Yet recent history suggests the two can be decoupled. 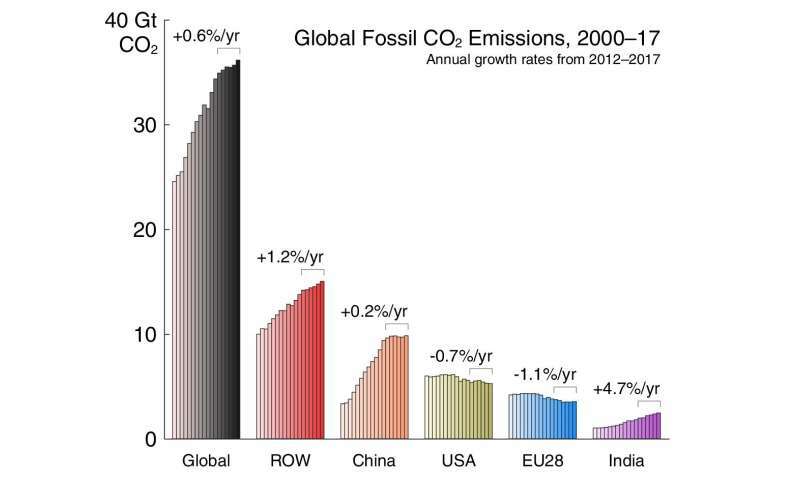 From 2014 through 2016, emissions held fairly steady despite growth in global gross domestic product, thanks in large part to reduced coal use in the U.S. and China, improved energy efficiency and an expansion of renewable energy around the world. "We can have economic growth with fewer emissions," said climate scientist Corinne Le Quéré of the University of East Anglia, lead author of the group's paper in Earth System Science Data. "There's no question about that." Over the past decade, at least 19 countries, including Denmark, Switzerland and the United States, reduced carbon dioxide emissions from fossil sources while their economies grew. In 2019, barring a global economic downturn, the researchers anticipate carbon dioxide emissions will rise further despite urgency to reverse course. According to Jackson, "We need emissions to stabilize and quickly trend toward the zero line."